This brilliant video from Richard D Wollf demonstrates have capitalism in the US unravelled Roosevelt’s New Deal. In the UK, there was a glimpse of an alternative to capitalism in 1945 and Wolff’s speech echoes Tony Benn’s call for a democratic revolution. Capitalism has failed. It is fuelled by competition. The winners consume the others, and become too big to fail. Wealth is polarised between the very rich and very poor. When people become so poor they begin to push back. That time has come. This brilliant video from Richard D Wollf echoes Tony Benn’s call for a democratic revolution. 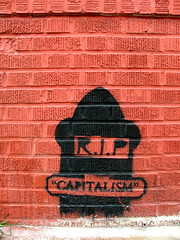 Capitalism has failed. It is fuelled by competition. The winners consume the others, and become too big to fail. Wealth is polarised between the very rich and very poor. When people become so poor they begin to push back. It’s time to demand a cure big and bold enough to work. Richard Wolff spoke on to hear that cure presented, explained, and justified. Instead of resignation to economic decline, come and help build real and positive change. Let’s have Tony Benn’s Democratic Revolution. Now. Choices and Freedoms and the Realities of Neoliberalism. Get Together! – Now we need Trade Unions like never before. This entry was posted in crime and civil liberties, Economics, Employment, Foreign Affairs, Globalisation, Opinion, Privatisation, Uncategorized, Unions and Political Activism and tagged capitalism, democracy, The cure for capitalism, Tony Benn by adminthinkleft. Bookmark the permalink.